Here is the Hermes, reproaching me for leaving her behind. You can just make out the missing Y key in the bottom row (on the left, next to the shift key). The red-and-white box next to it contains the skirt marker. While I kept telling myself it would have been a pity purchase, I did notice some people stopping by to take a closer look and I am sure at that price it would have sold quickly. Later that day, we swung by the thrift store and discovered a freshly stocked typewriter section, including this Olivetti Lettera 25 (terribly damaged, I'm afraid) and a '70s Brother (with fake woodgrain accents) next to it. Lurking in the back row, though, was this absolutely splendid Hermes 3000, which even has a nicer case than most (with the green handle). Quite rare to come across two 3000s in one day, and I briefly thought about getting it for Peter, but he already has one. So I stayed strong and resisted temptation yet again. Whew. Again I contemplated holding it for Peter, but he already has one of these (at least the Media version). 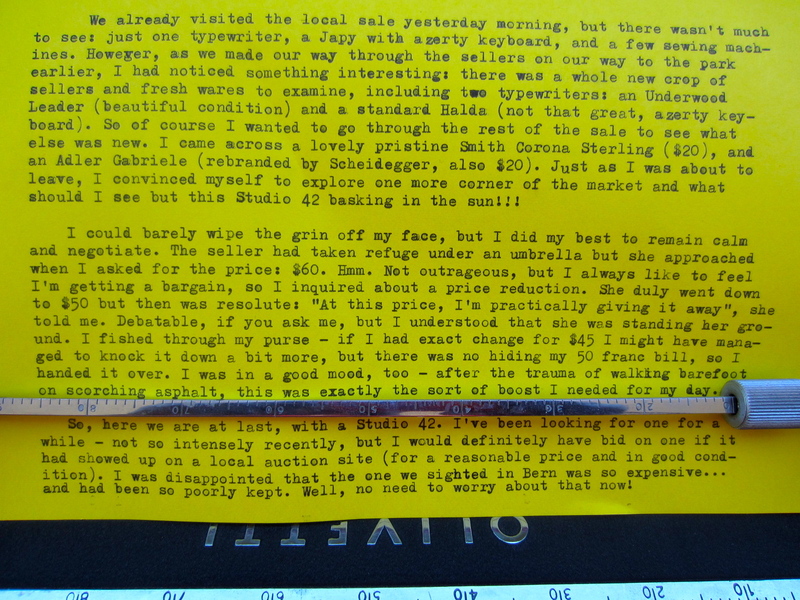 It is not often I come across non-pica/ elite typefaces, but this no-name (I suspect it's a rebadged Erika and I can't recall what the label said, President or some such) had a round epoca-like typeface, which I think is exactly the one Dirk showed off on his blog. The plastic body turned me off and I left it behind, but now I sort of wish I had brought it home to play with for a while. Oh, well. I should bend on my "no new typewriters"/ "no plastic typewriters" policy sometimes, I guess. And a Royalite that I hope for the seller's sake is not the same one I spotted in the market last year. It probably isn't; while they are rarely sighted, I think they were imported in sufficient numbers that seeing one a year is not outside the realm of possibility. Peter tries out the Rooy. A storm brews over our type-in at the park. The view down to the lake from our picnic spot. There weren't very many others in the park. Peter tries out his Triumph Tippa. My typecast on the spot. 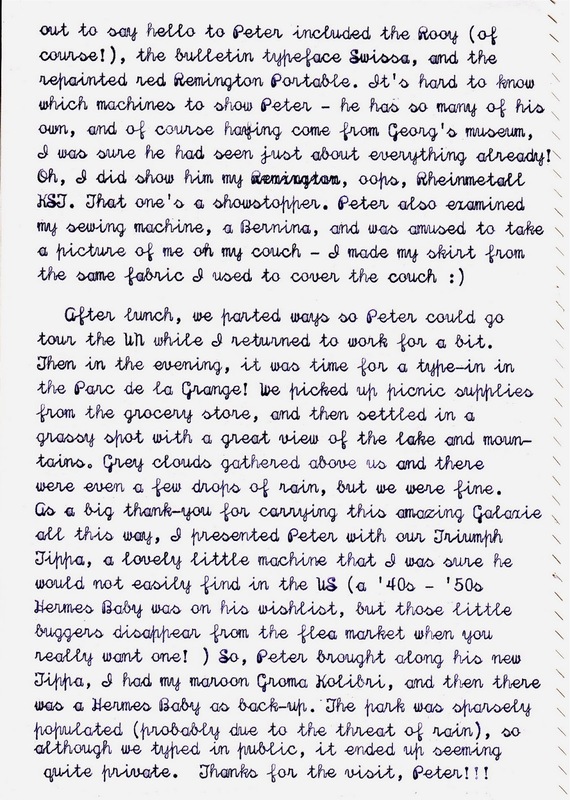 We didn't take along the Galaxie because I was sure Peter had had enough of typing on it for a while! Oh, well, I suppose I should put up a picture of myself as well. 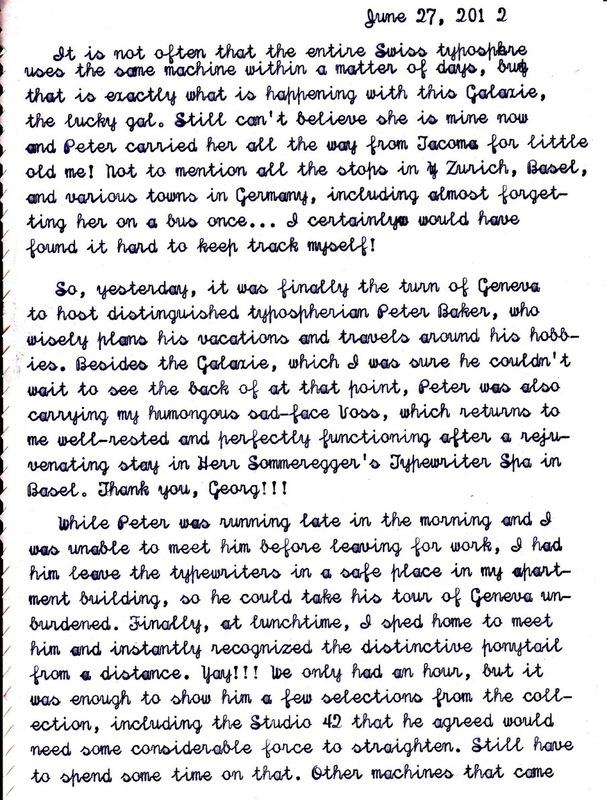 More on Peter's blog, including me blending remarkably well into my couch! I rather like the light green color here. Elna Supermatics seem plentiful in Geneva and I have read good things about them, but for space reasons I shall not be bringing one home just yet. They probably weigh a ton, too. I already have one heavyweight machine (I know, I know, post on it upcoming) and I don't foresee needing another. Another Swissie - this time a Bernina 125. Nice and portable - their Grasshopper equivalent, I would imagine. I was tempted to ask after it, but it looked like it had seen better days and that was certainly not the original case. 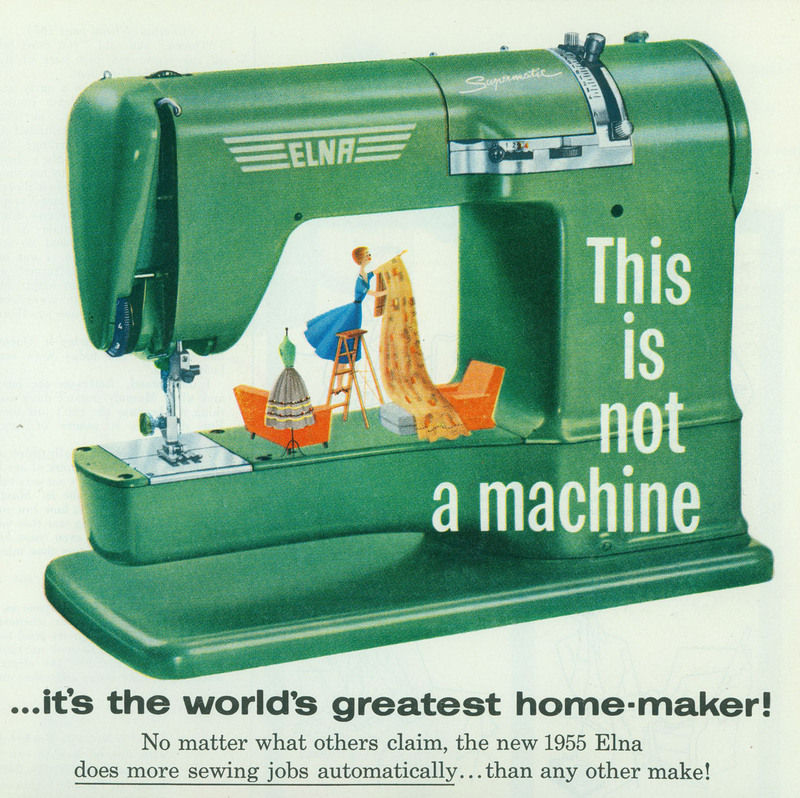 Including a hand-crank one that is exactly like the ones my mother and grandmother used, although I confess I have become spoiled using an electric one. This would be the perfect counterpart to a manual typewriter but they are a whole lot less portable! Since it is unlikely one would travel much with it anyway, why not tether it to an electrical outlet and make it easier to use? That's how I see it. Unless you live in Accra with frequent power outages, in which case this is the best option. 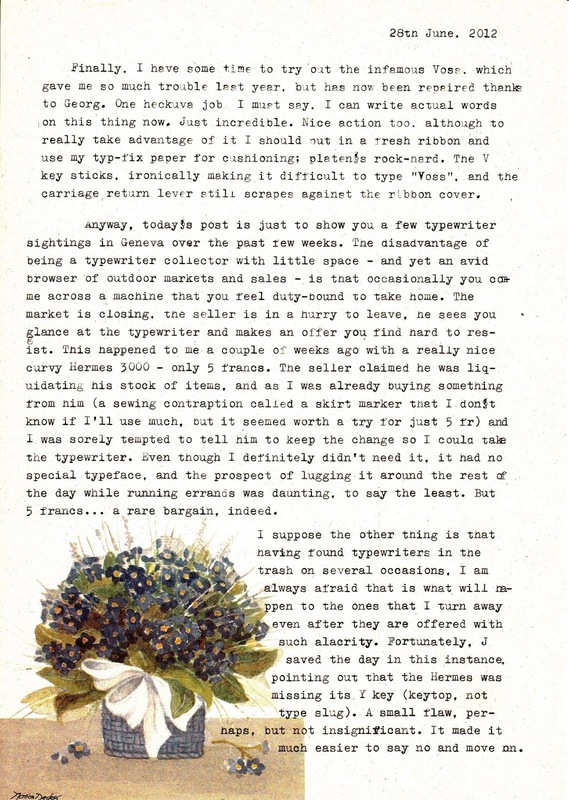 Anyone want to tell Alan Seaver that someone has pinched one of his pictures (of a Deutsche Remington) to sell a typewriter on Etsy? The funny thing is that the stolen picture does not match the description (apparently a Butler Brothers Remington No. 2), but the description is also lifted word-for-word from Alan's site. Whew. That is a lot of cutting-and-pasting! That sort of hard labor does not come cheap, either, only $350. I am looking forward to Robert Messenger's biting commentary on this funky atomic retro orange typewriter and the frenzied bidding it has received. mAybE I sHouLD L@@K into using random capital letters, too. 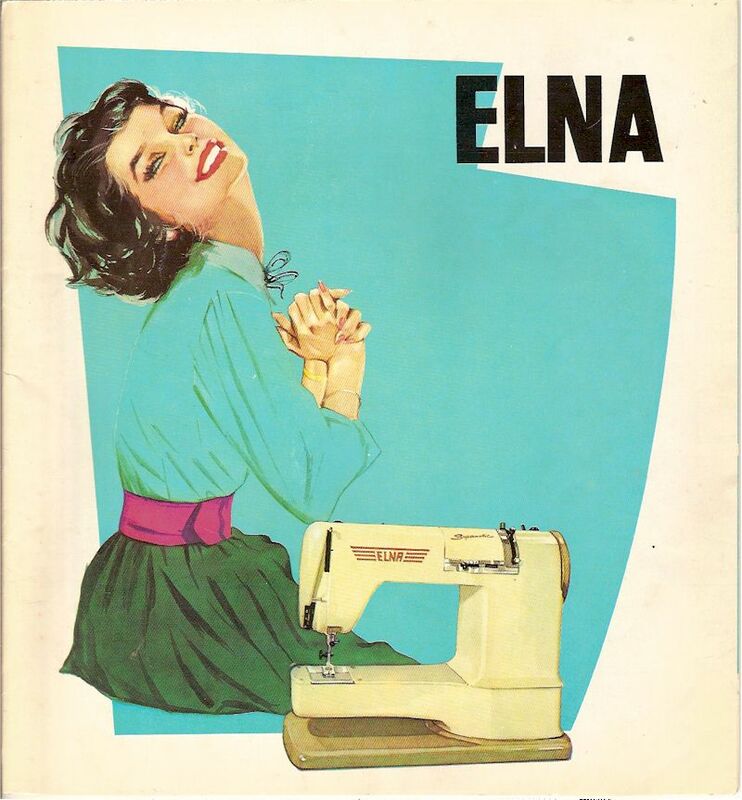 It is not often that I see a Swissa for sale in the US - I love how the seller does not know how to "change" it to type in cursive! Finally, this is a beautiful Rooy/ Roxy - or at least fetchingly photographed. It is nice seeing a QWERTY one of these pop up every so often. This later Underwood standard was not very far from where I picked up the Studio 42. 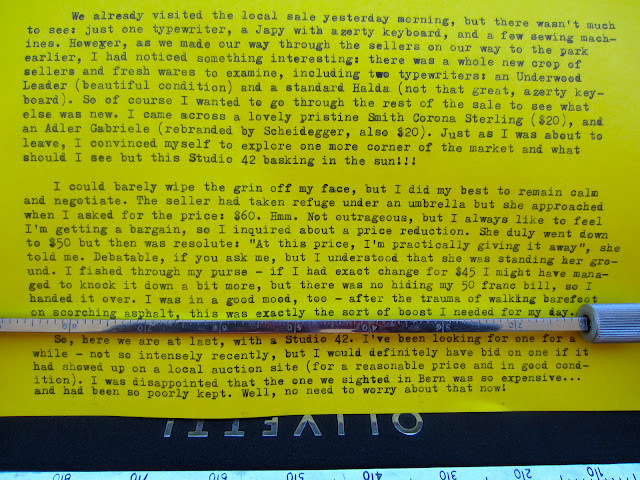 While this round-up of typewriter sightings does not include any particularly rare birds, I thought this Corona Silent was notable - it is not often we find these in the wild here, and even with a QWERTY keyboard. Well, this Olympia Traveller de Luxe looks familiar. I had one earlier this year but gladly parted ways with it. Looks like this seller has the same idea! This Japy portable was so popular that it seems to make up a good 10% of all typewriters I see listed for sale in France. This one crossed the border into Geneva, but didn't seem to be attracting any more interest. I could tell the seller of this Royal would ask a lot for it - after all, he had gone to all the trouble of writing down its history on an index card stuck in the platen. A Royal KHM/KMM? Again, not very common here. I suppose the Americans had a strong showing! 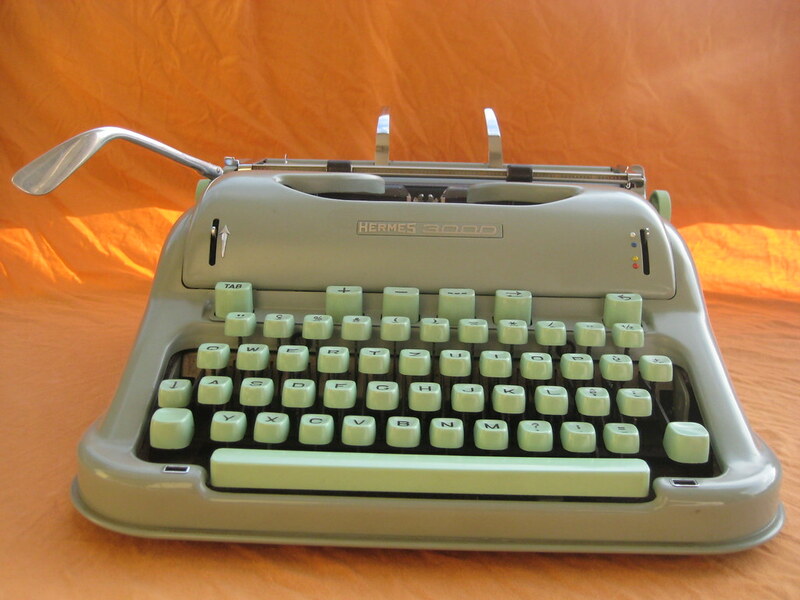 This Remington Monarch was only $15 and the mint-green color was lovely, but it was otherwise rather ordinary. An Olympia SM-8, type bars raised in the classic "I was just mauled by a small child" salute. A Hermes Baby makes an appearance - of course. Two nicely-maintained typewriters turned up in my neighborhood over the weekend: an Adler Gabriele and a Smith Corona Sterling, $20 each. A fine Halda standard, but that French keyboard will be a pain to use. My favorite sighting: absolutely pristine Underwood Leader. Just lovely. Whoa. The funny thing is that this does not affect the typing action in any way, except for an annoying click when the space bar hits the frame as you type. If you can ignore that - which I will learn to, I guess - this typewriter is perfectly functional for producing a page or two of text. When I found it, it was propped up in such a way as to mask the damaged case, shown above. Fortunately, some glue and a couple of screws have made it whole again, although I would not trust it to fully support the weight of the typewriter. I'm surprised how flimsy it feels, though. Here it is, as found - just ignore my giant shadow. Not easy to detect the broken case, as you can see, and I was more concerned with making sure it typed properly than checking for a bent frame. Quite impressive that despite the damage sustained, it still works so well. I haven't cleaned it properly yet - still a bit of dust and eraser shavings to get rid of - but it was in a decent enough state to be photographed. I think my favorite part is how the typebar cover swings out on a hinge. Beautifully designed. It's not often that I just happen to stumble across a typewriter I have been coveting, which is why I'm naming this my find of the year (at least so far). 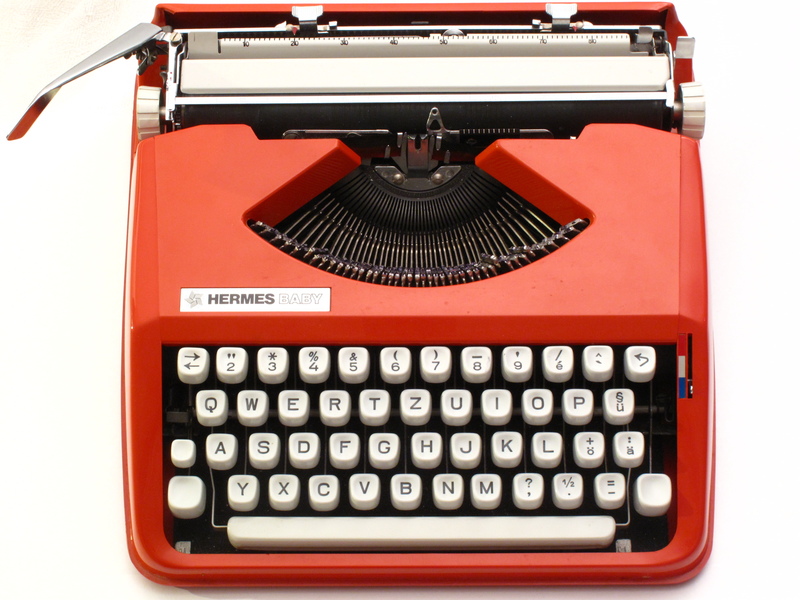 I suppose last year's equivalent would be my script Hermes Baby, as script typewriters are notoriously difficult to find in the wild in Switzerland. After discovering the bent frame, I thought seriously about whether I wanted to keep this or not, but I have decided that I will. 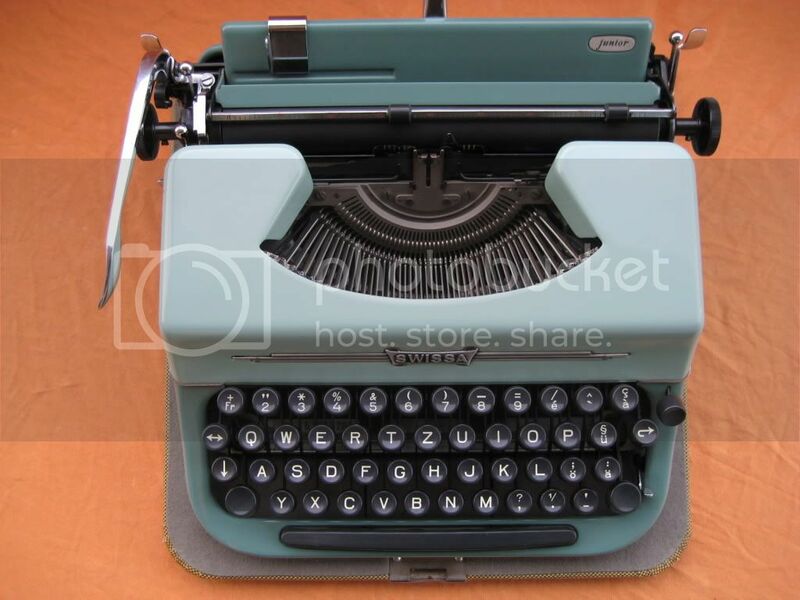 It's taken me a couple of years since I first coveted one to come across this, and it has a desirable QWERTY keyboard and a crisp elite typeface (just need to clean the type slugs, though). So until I come across a better one, this will do nicely to fill up the Olivetti Studio gap in the collection (we parted with the 44, and I wouldn't want a 45 or 46). Besides, if I am bothered by how it looks in the front, I can just turn it around and admire it for a while - the back view is just about perfect :).